Relive history by visiting the Historic Ships in Baltimore, one of the most impressive collections of military vessels in the world. Located at the Inner Harbor within walking distance from each other, the US Sloop-of-War Constellation, the US Submarine Torsk, the US Coast Guard Cutter Taney, and the Lightship Chesapeake illustrate life at sea from the mid-19th century to the mid-1980's. Also included in the collection is the Seven Foot Knoll Lighthouse which marked the entrance to the Patapsco River and Baltimore Harbor for over 130 years. The Historic Ships in Baltimore are located at Piers 1, 3, and 5 of the Inner Harbor. 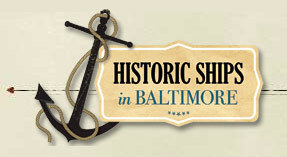 Convenient and affordable parking is available near the Historic Ships in Baltimore. Click on a location name for parking details including rates, hours of operation, and directions.